The Patriot Exhaust System line by Gibson Performance is easily the most unique performance exhaust system line we've seen to date. If the name doesn't already imply it, these systems are mean! 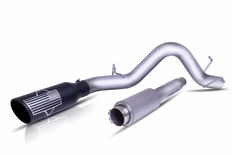 Gibson Patriot Performance Exhaust Systems feature stainless steel piping that is mandrel bent for optimal flow. At the end of the system is a ceramic coated black exhaust tip with the American Flag featured on the side. The edge of the Exhaust tip is rolled for an improved look.